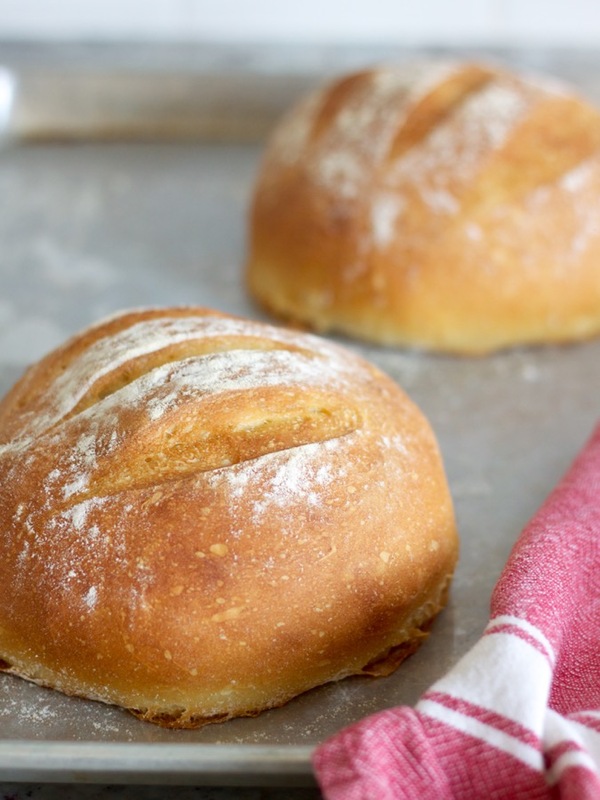 I can’t even count how many times I’ve made this no-knead bread…because it’s that easy. 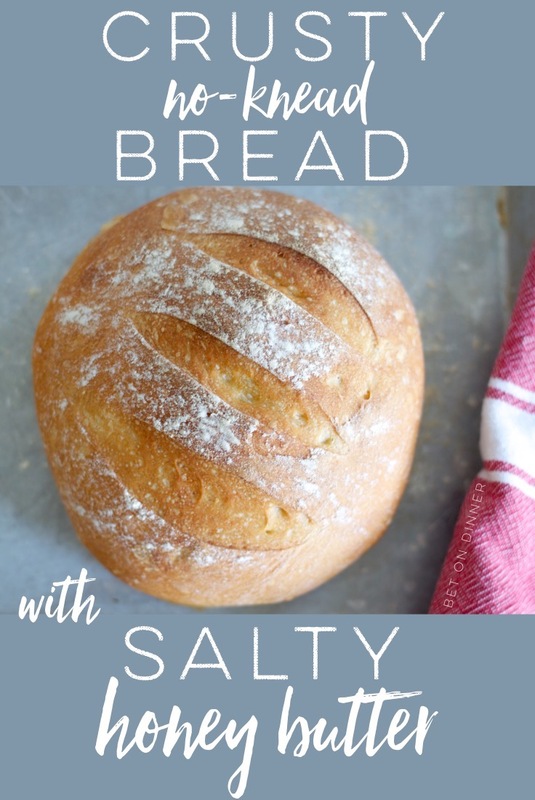 Four ingredients (if we’re even counting water as an ingredient), one bowl, no kneading – and the end result is piping hot, crusty-on-the-outside, soft-on-the-inside bread that also happens to be beautiful. And then you slather it with honey butter with a hint of salt and sweet-salty-soft-crusty magic happens. This recipe is super flexible – make 1 loaf, or 2 or 3 or 4; make the dough ahead of time and keep it in the fridge; bake all your loaves at once or over a couple of days! It doesn’t really matter how many loaves you make, though – you probably won’t have any left over. Is “serving size” really a relevant term when you’re talking about bread that’s still warm from the oven?? You have been warned. So: mix warm water with kosher salt and yeast. Stir in flour until it’s all incorporated and you have a shaggy dough ball. Cover the bowl with a towel and let it rise for a few hours. It has a lot of yeast in it, so it will get really bubbly, and it looks pretty wet! …and a lumpy, pinched-together bottom. Give the dough some room to grow on a baking sheet (a light sprinkle of flour on the pan is good, too). I like to go ahead and turn the oven on to 450 at this point, and put a broiler pan on the bottom rack. The dough balls rise for about 40 minutes, then get a sprinkle of flour on top and a few slashes. 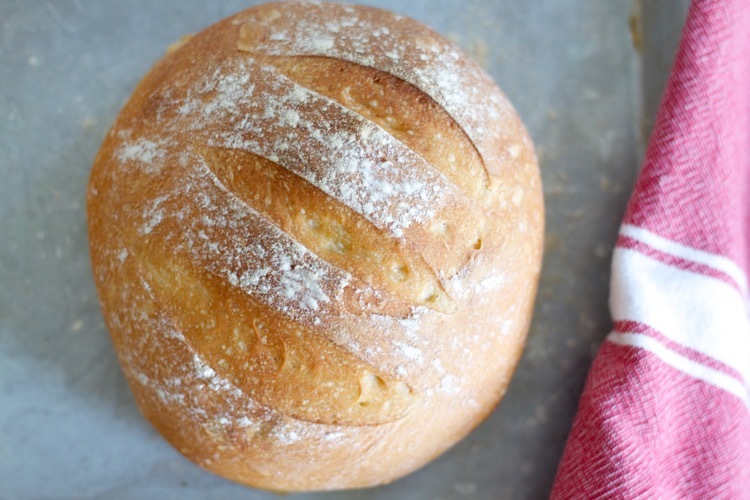 The no-knead bread gets its lovely crispy crust from steam in the oven – that’s where your broiler pan comes in! Just pour in a cup of hot water when you put the bread in the oven. After 30 minutes, the loaves are nicely browned and your house smells glorious. 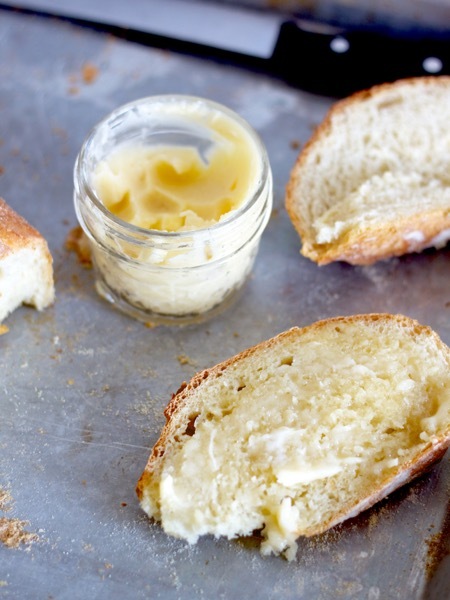 The honey butter isn’t strictly necessary, but super easy – you don’t even have to measure, just eyeball and taste! You can mix it up by hand if your butter is soft enough, or whip it with a mixer. I probably don’t need to tell you that no-knead bread goes with anything – any of these soups, obviously. Spaghetti, for sure. But it can also breathe life into a leftovers meal, or make your virtuous grilled-chicken-on-salad dinner much more exciting! Bring it to a potluck, and be prepared to be a hero. Mix yeast and salt into the water in a large bowl, reserving a couple tablespoons of the water. 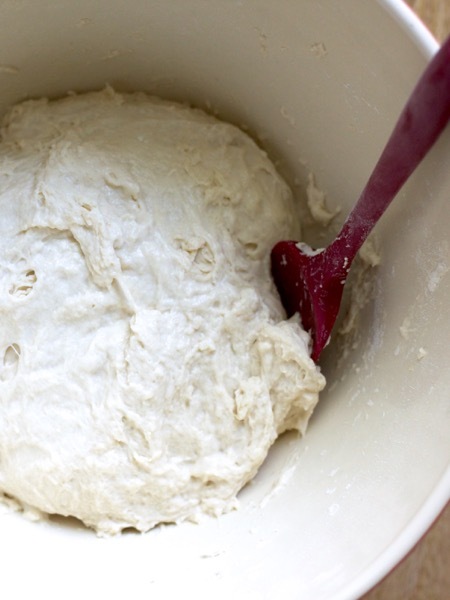 Stir in flour and mix until a shaggy, loose dough ball forms and all of the flour is incorporated. Add the reserved water if you need it to incorporate the flour. You don’t want the dough to be so wet that it’s hard to shape later. 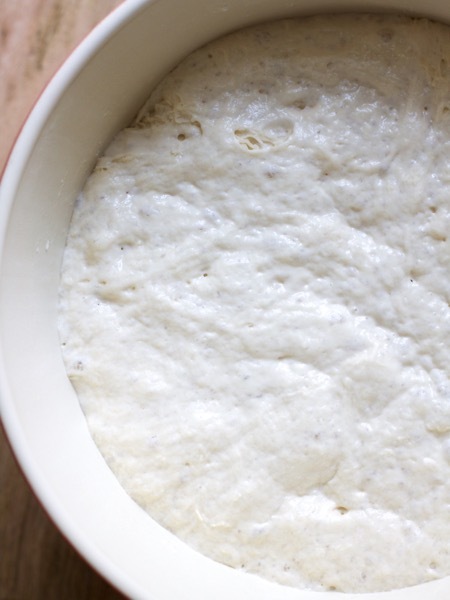 Cover the bowl with a towel and let the dough rise at room temperature for about 2 hours (or up to 5 hours). 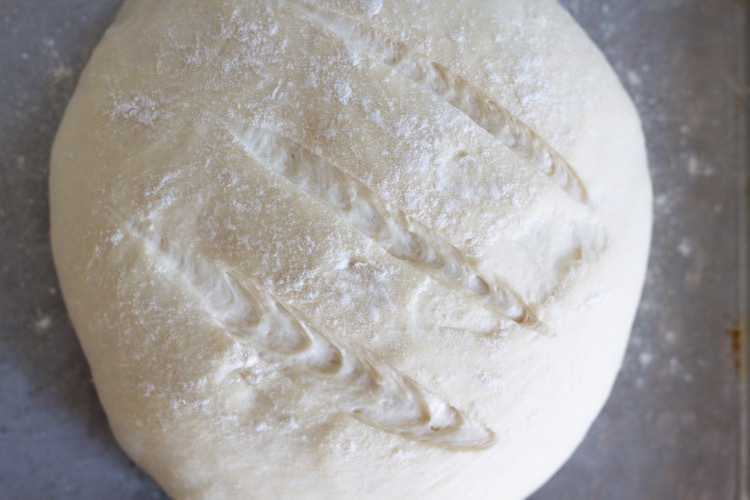 You can bake it right away or cover and refrigerate the risen dough for up to a week! To bake at this point, sprinkle the surface of the dough with flour and cut it in half (if making 2 loaves). Form each piece into a boule by stretching it lightly in your hands and tucking the ends under until you have a round ball with a smooth top and a lumpy, pinched-together bottom. Place each ball on a lightly floured baking sheet, giving them room to grow and spread out a bit. Cover the dough balls with a towel and let them rise again for about 40 minutes (if the dough has been refrigerated, increase this rising time to 1 hour!) while you place a broiler pan in the bottom rack of the oven and preheat the oven to 450. Dust the dough with a little flour and cut a few slashes in the top with a sharp knife (I use my serrated bread knife). Open the oven and slide out the bottom rack. Pour one cup of hot water into the broiler pan, then slide that rack back in as you put the bread pan on the middle rack and quickly close the oven door to trap the steam. Bake for 30 minutes until the loaves are well-browned. I recommend checking the bread after 20 minutes, and if it’s already brown, tent each loaf loosely with foil (I just drape a piece right on top). To make the salty honey butter, mix butter, honey, and kosher salt by hand, or whip it with a mixer. Slather it generously onto warm slices of bread! 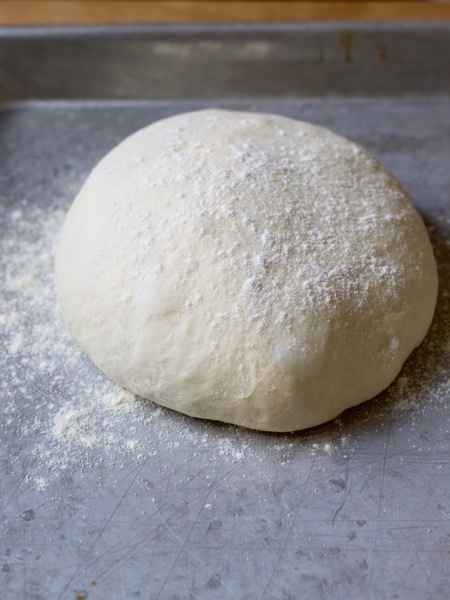 Homemade Pizza, Part 1 - The Dough. OK… This looks amazing. Do you know if I could use active dry yeast instead of instant (is that the same as rapid rise?) yeast? I don’t know the practical difference. Laura, instant and rapid rise are the same. I think you could try active dry yeast but it might need more rising time (the longer end of the 2-5 hour range for the first rise and maybe a longer second rise time? )…this article makes it sound like there’s not much difference! 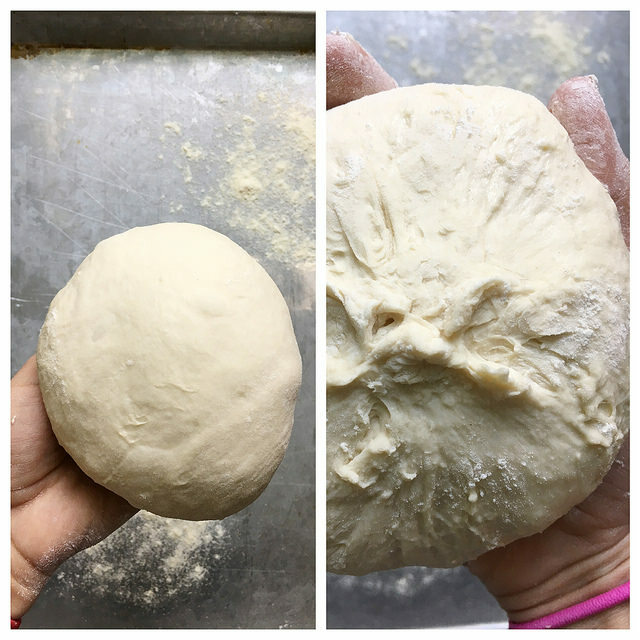 http://www.kingarthurflour.com/recipe/yeast.html Let me know if you try it! I love the store-in-fridge feature. I made the 4 loaf version and cooked two and am SO EXCITED to have two more nights of bread waiting for me!! Bet – do you know if you can do this with whole wheat flour? I use mostly King Arthur White Whole Wheat these days. Thoughts? I just want to say, thanks for doing the complicated 3-loaf recipe so that I can just start measuring and not do any math!! Right?? I had done it so.many.times! Hi! I don’t know if you remember me from UF, but I stumbled on your blog and I’m running (driving) to the store in a few to make this!! My carb boys will loooove this! Hope you are well! Love your family friendly recipes! Making my TJ’s list, too! Hi, Sonja! So nice to hear from you! :o) Hope you guys love the bread as much as we do. Thanks for commenting and saying hi!! Can you add herbs or spices in the dough or on top of the loaf? Alison, I bet that would be super good! Let me know if you try it out!